ABOVE: A vintage Djurgården ferry loads passengers at Skeppsholmn. INSET BELOW: The historic excursion boat S.S. Stockholm. Stockholm is a maritime city, and--especially during the summer season--ferries offer convenient shortcuts between its major islands. 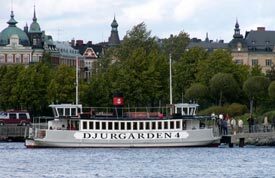 In the city center, you'll see antique Djurgården pedestrian ferries zigging and zagging through the harbor almost constantly. These antique ferries carry some 2.4 million passengers a year, primarily in summer. Other ferries serve the suburbs or towns in the archipelago of 28,000 islands between Stockholm and the Baltic Sea. For timetables and other information, see Fjäderholmslinjen and Waxholmsbolaget. The harbors of Stockholm are jammed with excursion boats of every variety, from historic steamers to modern tour boats. Strömma offers a good selection of boat tours, including a "hop-on hop-off" boat that stops at the major sights. You can take either the Royal Canal Tour or the Historical Canal Tour free with the Stockholm Card. Finally, Waxholmsbolaget (already mentioned under "Ferries" above) offers both transportation and excursions on its fleet of classic steamers, fast ferries, and year-round vessels.